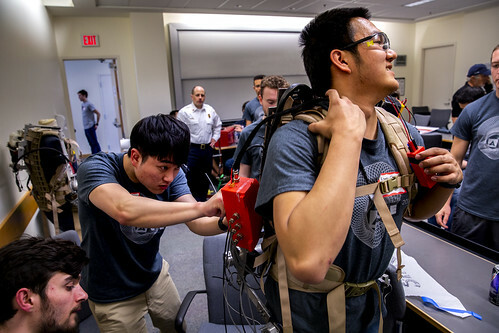 Five collegiate exoskeleton teams showcase their mechanical suits for rescue workers engineered to provide extra strength in a variety of situations. At the first Applied Collegiate Exoskeleton (ACE) Competition, the requested attire was circuits and motors. Teams from five schools gathered to tune-up, learn, and demonstrate their powered mechanical suits, which augment the wearer’s strength and abilities. This includes helping assembly line workers with repetitive movements, baggage handlers lift luggage, and helping disabled people become more mobile. Teams at ACE created their exoskeletons for use by rescue workers. “We believe if you can get someone into a dangerous situation with more energy, they can make better decisions, and if they really need to book it, they will have more energy to do so,” Winship said. The five teams at the competition included University of Michigan, Michigan State University, University of Nebraska Omaha, Colorado School of Mines, and Iowa State University. Despite the competition and teams’ youth, the enthusiasm for the technology brought several attendees. Michigan State’s STARX exoskeleton team, in its first year, brought 30 members to the competition. Jessica Mosier, a junior studying mechanical engineering who led the organization of the competition, noted the high level of collaboration between teams and sharing ideas for improvements. “Everyone is so happy to be here and wants to see this type of event more often,” she said. Creating the suits, however, is an endeavor, and many teams ran into trouble building a device that had all components working. “I’d estimate it took 1,200 hours to build our exoskeleton so far,” said Leo McManus, a U-M junior studying mechanical engineering and the team’s mechanical lead. “We just kept running into issue after issue with the electronics, and only got them sorted out at 4 a.m. last night,” said Owen Winship, U-M STARX team member and computer engineering student. Out of the five teams, three were able to put forward a functioning exoskeleton to compete. “Even if a team doesn’t have a suit here today to test with, they’re still excited to fix things that went wrong, make improvements, and come again next year,” said Rabideau. The exoskeletons were put through tests similar to those for entry-level firefighters. After a design review, where safety components and how long it took to suit up were assessed, the exoskeletons were fitted with 75 pounds of weights and timed while moving through an obstacle course: on balance beam, up and down stairs, across uneven terrain, under a low-clearance beam, and dragging a 165-pound mannequin for 100 feet. Judges for the event included Jessy Grizzle, Elmer G. Gilbert Distinguished University Professor and Director of Michigan Robotics, Deanna Gates, Director of the Rehabilitation Biomechanics Laboratory and assistant professor of kinesiology, Mike Kennedy, Ann Arbor Fire Department’s Fire Chief, and Dragi Gasevski, an engineer at Altair. Colorado School of Mines won the overall competition, edging out the U-M host team by less than a tenth of a point on a 650-point scale. MSU took third place. Mosier says the U-M team plans to host the event again next year.